In a large bowl, stir together Bisquick™, milk and eggs until well combined. 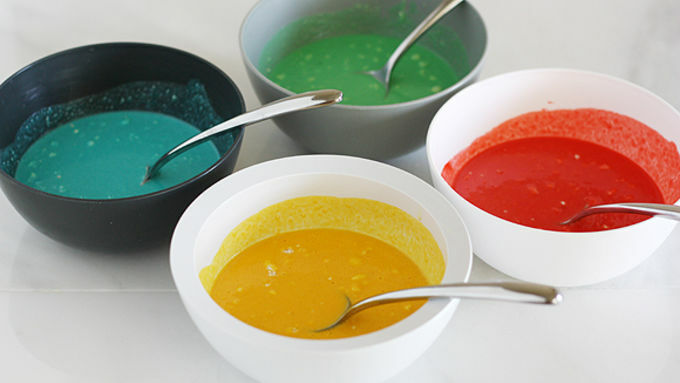 Divide batter among four small bowls; add a few drops of food coloring to each bowl (one red, one yellow, one blue, one green) and stir to combine. Heat a small skillet over medium heat. Spray skillet lightly with cooking spray and spoon 2 tablespoons red-colored batter into the skillet. Swirl skillet to coat entire bottom with batter. Cook 30 seconds until set on the bottom; flip and cook another 15-20 seconds until set. Transfer to a plate to cool. 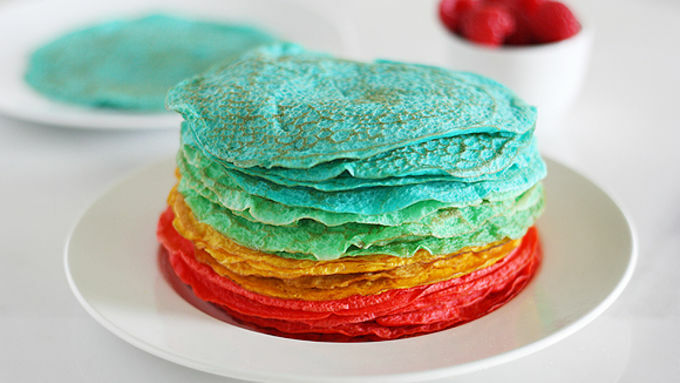 Repeat with remaining batter (all colors), stacking crepes on a plate to cool completely. When crepes are fully cooled, place a blue crepe in the center of a serving plate. Spread a scant tablespoon yogurt on top of crepe. Top with another blue crepe. 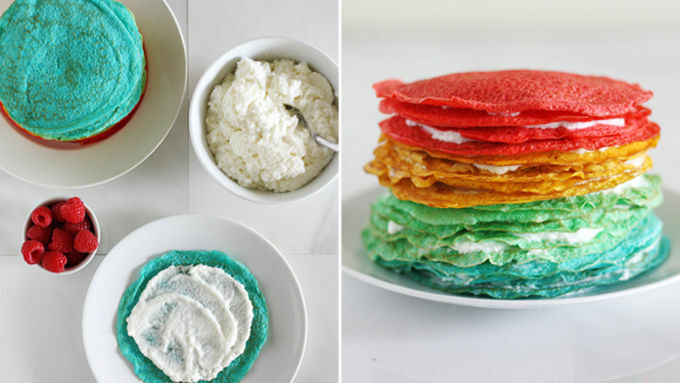 Repeat until all the blue crepes are used, then continue with the green, then yellow, then red crepes, stacking as you go. 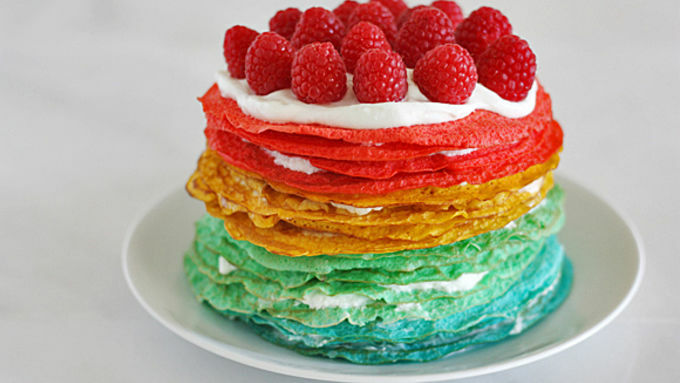 Save the prettiest red crepe for the top layer and leave plain. Reserve about 2 tablespoons yogurt. Carefully transfer stack on plate to freezer; freeze until set, about 1 hour. Top cake with remaining yogurt, then garnish with fresh raspberries. Serve immediately. Well, there’s not much to say about this cake except to say that YOU NEED TO MAKE THIS CAKE. Ahem. Sorry for all the shouting. It’s just that YOU NEED TO MAKE THIS CAKE. I mean… Seriously though, folks. 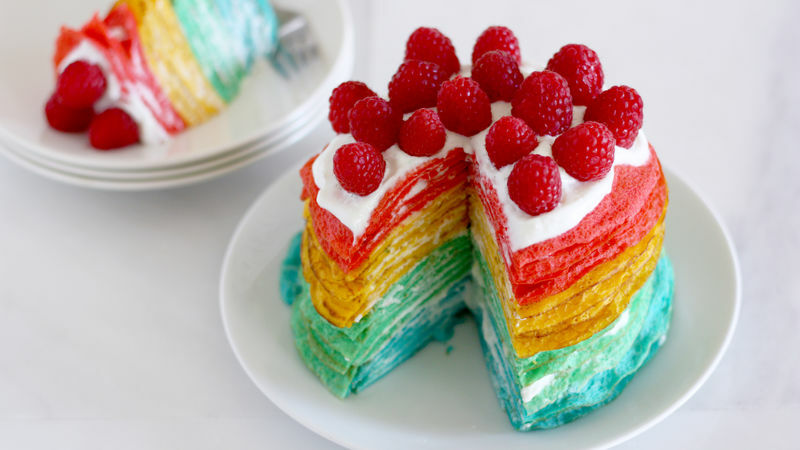 A Rainbow Crepe Cake, are you freaking kidding me? It’s kind of like making a rainbow layer cake only one billion trillion times easier (or, you know, just regularly easier). The vanilla yogurt layers also make the cake not only taste like vanilla heaven, but it’s way healthier for you than frosting. And it’s rainbow-colored. So like I said, YOU NEED TO MAKE THIS CAKE. Moving along. I used red, yellow, blue and green food coloring but feel free to mix and match and use whatever colors you fancy. So as I was saying, YOU NEED TO MAKE – OK, OK. I’m sure you heard me already.